Beta-hydroxybutyrate (or BHB) is a topic often discussed in keto circles, but one that might seem foreign to an outsider. Whether it’s talk of the ketogenic diet or ketosis or exogenous ketones, understanding BHB is essential to developing a well-rounded knowledge of keto. It can be a confusing topic, but we’ll demystify BHB by explaining it from several angles. In this piece, we analyze the science behind BHB, what it does, where it comes from, and why it’s important for optimizing your keto goals (whatever they may be). A ketone is defined as having carbonyl carbons (carbon joined to oxygen with a double bond) bonded to two other carbon atoms. BHB has a carbonyl carbon, but it’s only bound to one other carbon atom. Before exploring BHB further, let’s develop a basic understanding of what ketosis is, and how it works. Ketosis marks the presence of ketones in the body, usually at >0.5mM. Ketosis is usually achieved through endogenous ketones, meaning ketones are produced naturally by the body as a result of diet or fasting. You can read more deeply about the nuances of ketosis here. When we eat carbohydrates, they’re converted into glucose in the blood. Glucose is then used as our brain’s fuel source–but when carb intake is restricted (like when following a low-carb, high-fat ketogenic diet) the brain requires an alternate fuel source. While most other organs in the body can use fat as fuel, the brain can’t; however, the brain can use ketones for energy. Acetone is the least abundant, produced in much smaller amounts, and is usually exhaled through the lungs rather than being used as fuel.4 Acetoacetate is part of the metabolic pathway whereby humans make and use ketones, but it tends to be found in the blood at lower levels than BHB. BHB is the predominant ketone body in the blood. Subscribe to receive our exclusive guide of the best foods for the keto diet. It happens two different ways. Endogenous ketones are produced by the body naturally through a low-carb diet or fasting. The process for creating endogenous BHB is called ketogenesis. The ketone produced in a fasted state via ketogenesis is Acetoacetate (AcAc). Fatty acids are broken down to produce acetyl CoA, which then undergo a chain of reactions to eventually form AcAc. In the liver, the BHB-dehydrogenase enzyme reduces AcAc to form BHB. This BHB then goes on to be used as fuel for the body as the primary circulating ketone body. The best way to increase production of endogenous BHB is to reach a state of nutritional ketosis by reducing carbohydrate intake or fasting. Priming the body to trigger endogenous ketone production takes time and effort. To provide a quicker alternative to natural ketone production, there are exogenous BHB ketones which can be consumed through supplements. Exogenous ketones come from an external source since they’re not produced in the body. There several different options when considering which exogenous ketone supplement to take. The most advanced exogenous ketone product on the market is HVMN Ketone. It can raise blood ketone levels almost immediately without the need for weeks of dieting or fasting. Our flagship product is pure BHB, used by professional athletes and the US Military; try it here. MCT Oils: Medium chain triglycerides (MCT) don’t contain BHB, but consuming MCT oils can moderately raise BHB. They contain fat molecules that are easily converted into BHB. MCTs require more processing inside of the body compared to other types of exogenous ketones and therefore take longer to get a body into ketosis. They’re also calorie-dense (a natural source of MCT is coconut oil), so it may be ultimately counterproductive to rack up calories just to elevate ketones. Combining sodium and potassium to bond BHB is cost-effective, but it can lead to excessive sodium consumption to attain the desired level of blood ketones. An advantage of ketone salts is that they’re high in electrolytes; so they can replenish electrolytes lost in urine while on the ketogenic diet. Ketone Esters: Ketone esters are composed of a raw ketone molecule (BHB or AcAc) bound to a ketone precursor using an ester bond (butanediol or glycerol). For athletes, in particular, using exogenous ketone bodies like HVMN Ketone allows them to receive some of the benefits of ketosis without the time spent fasting and dieting to achieve nutritional ketosis. Having discussed BHB, and how it gets into the body, it’s time to look at its benefits. As the main ketone body, BHB acts as an energy source. Through ketolysis, ketones are broken down using aerobic respiration inside the mitochondria. Ketolysis occurs throughout all tissues in the body except the liver (because the liver doesn’t contain one of the key enzymes for ketone oxidation). When BHB enters the mitochondria of the cell, it’s converted to acetoacetate, after which it undergoes a reaction where CoA is added. The result is acetoacetyl-CoA, which is cleaved to form acetone and acetyl-CoA. Ketones are clean-burning because they reduce the production of potentially harmful reactive oxygen species (ROS) inside cells. They’re also able to scavenge (clean up) ROS produced by other metabolic processes. BHB easily crosses the blood-brain barrier (crossing from the peripheral circulation to the central nervous system).2 While BHB can provide energy for the body, it’s particularly well-suited to provide energy for the brain. This combination of energy provision, neurotrophins and anti-inflammatory benefits illustrate that BHB has broad-spectrum effects that might improve the pathology of various neurological conditions. Increased levels of BHB in the body were found to be associated with greater cognitive performance through better performance in memory recall tests12 on a study of 20 subjects with Alzheimer’s disease or demonstration of a mild cognitive deficit. Similarly, BHB ketone esters helped to reverse symptoms of Alzheimer's Disease in one clinical case study.13 More research in humans is needed, but the various hypotheses are backed up by strong animal data. For those looking to maintain ketosis, testing should be regularly undertaken to verify the presence of ketones in the blood, breath or urine. In blood, BHB is the most prevalent of the ketones. It’s widely used to measure ketone levels because it is present at far higher concentrations than Acetone and Acetoacetate and it exists outside the cell, making it both easy to measure and accurate. 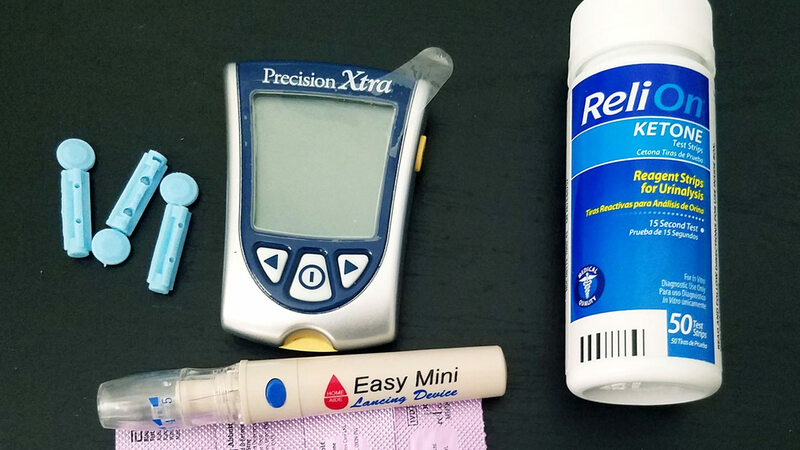 A handheld blood glucose monitor is the most common measuring tool, as it has the capability to also measure blood ketone levels. The test is akin to a diabetic testing blood sugar with a finger prick. BHB plays a pivotal role in the world of ketones and ketosis. Knowledge about BHB will help further map the keto landscape, and allow anyone to plot a course to achieve their goals. It’s your body–knowing how it works can empower you to make the best decisions for it. 1. National Center for Biotechnology Information. PubChem Compound Database; CID=441, https://pubchem.ncbi.nlm.nih.gov/compound/441 (accessed Feb. 7, 2018). 2. Sleiman SF, Henry J, Al-Haddad R, et al. Exercise promotes the expression of brain derived neurotrophic factor (BDNF) through the action of the ketone body β-hydroxybutyrate. Elmquist JK, ed. eLife. 2016;5:e15092. doi:10.7554/eLife.15092. 3. Kossoff, E.H., and Rho, J.M. (2009). Ketogenic Diets: Evidence for Short- and Long-term Efficacy. Neurotherapeutics 6, 406-414. 6. Murray, A.J., Knight, N.S., Cole, M.A., Cochlin, L.E., Carter, E., Tchabanenko, K., Pichulik, T., Gulston, M.K., Atherton, H.J., Schroeder, M.A., et al. (2016). Novel ketone diet enhances physical and cognitive performance. FASEB J. 9. Stojanovic V, Ihle S. Role of beta-hydroxybutyric acid in diabetic ketoacidosis: A review. The Canadian Veterinary Journal. 2011;52(4):426-430. 10. Lutas A, Yellen G. The ketogenic diet: metabolic influences on brain excitability and epilepsy. Trends in neurosciences. 2013;36(1):32-40. doi:10.1016/j.tins.2012.11.005. 11. Yamanashi, T., Iwata, M., Kamiya, N., Tsunetomi, K., Kajitani, N., Wada, N., Iitsuka, T., Yamauchi, T., Miura, A., Pu, S., et al. (2017). Beta-hydroxybutyrate, an endogenic NLRP3 inflammasome inhibitor, attenuates stress-induced behavioral and inflammatory responses. Sci. Rep. 7, 7677. 12. Reger, M.A., Henderson, S.T., Hale, C., Cholerton, B., Baker, L.D., Watson, G.S., Hyde, K., Chapman, D., and Craft, S. (2003). Effects of beta-hydroxybutyrate on cognition in memory-impaired adults. Neurobiol. Aging 25, 311-314. 13. Newport, M.T., VanItallie, T.B., Kashiwaya, Y., King, M.T., and Veech, R.L. (2015). A new way to produce hyperketonemia: use of ketone ester in a case of Alzheimer's disease. Alzheimer's & dementia : the journal of the Alzheimer's Association 11, 99-103.